Planning a trip to France in the winter? 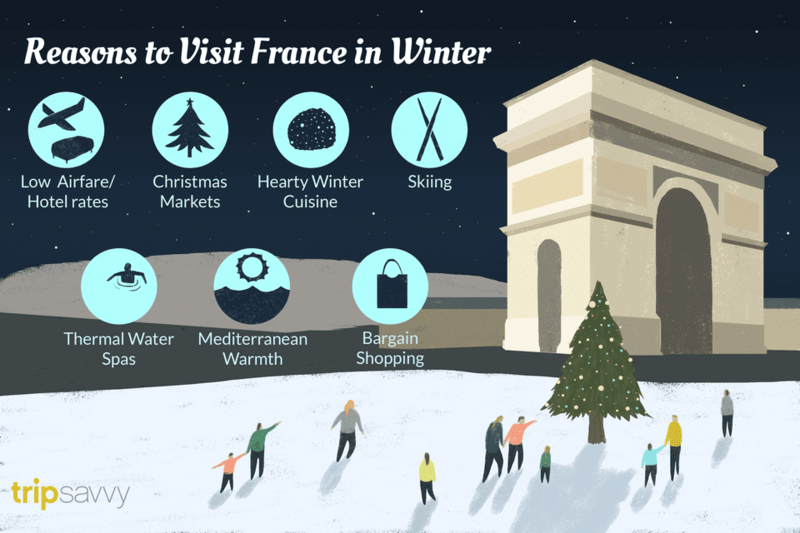 It’s a great time to visit, so check out all you need to know about this less popular season from cheaper airfares to winter sports, fun festivals, and those famous Christmas fairs during the French holiday season. And don't forget the official, government-controlled sales for real bargains. Generally airfares are much lower during winter, with the exception of the Christmas holiday season in December when they are quite high. In December you will find that airfares rise to normal levels, particularly the closer you get to December 25th, but in November, January, February and most of March there will be special prices on offer. The prices begin to rise again about a week before Easter. Hotels also have great bargains so check them out for deals like three nights for the price of two, and special themed packages. Christmas markets sparkle with lights and fill the air with the scents of cloves, Provençal soaps, and spiced wine. Small wooden booths fill the streets with the sights and sounds of the Christmas season and are great places for finding gifts you can’t get anywhere else, often from local producers and artisans. The surrounding shops get in the mood as well with bright windows full of tempting items. There are often skating rinks attached to the markets, many with carousels and entertainment for children. Christmas markets are set up all over France, and there are several in Paris, but the best known ones are in large cities in the north like Lille and Strasbourg. Small towns like Castres in the Tarn also have delightful markets. Most markets open either at the end of November or beginning of December. Some close on Christmas Eve while others continue until the end of December. Also look out for chateaux that open especially around Christmas. They are often beautifully lit with candles, and the gardens look like something out of a fairy tale. Check out dates for Vaux-le-Vicomte, a short train ride from Paris. French food in winter takes on a heartening, earthy feel. And nothing is earthier than those famous black truffles. You can go on a truffle hunt yourself, or buy the black riches at places like Carpentras in the Var where the weekly Friday truffle market lasts from mid-November to early March. Mushrooms in all forms are sold in markets and appear on restaurant menus. November festivals in Brittany and Normandy bring the harvest of the sea to coastal towns. At Christmas, shelves in shops from large supermarkets to small local epiceries groan under the weight of festive foods like foie gras, smoked salmon, and divine chocolates. France has some of the largest and greatest ski areas in the world like Les Trois Vallées, Paradiski Espace Killy, and more. Skiing in France offers both challenges to the world’s top skiers and slopes suitable for beginners, luxury resorts like Courchevel, and family-orientated places such as Flaine near Mont Blanc. The Alps is the best known area, but there are other mountain ranges in France to consider as well. Transport links are very good as the French airports of Chambery, Grenoble, Lyon Bron, and Lyon St. Exupéry are close to each other and the surrounding ski areas. If you’re coming from the UK, there are plenty of cheap flights on low-cost airlines. Either fly direct, or spend the night in Paris, board the train early the next morning, and start skiing that day. All the resorts have English-speaking instructors and those from the Ecole du Ski Français are trained to teach children from the age of three as well as people who are blind or have disabilities. The apres-ski scene is pretty lively in most resorts and many of them hold spectacular festivals throughout the winter from snow sculpture competitions to classical music and jazz concerts. In the past few years, French ski resorts have invested heavily and effectively in winter sports other than downhill skiing. Many now offer showshoeing, skiddoing, toboganning, and skating, as well as cross-country skiing and ski jeering (where you’re pulled along on skis behind a horse). More extreme sports like ice diving are gaining in popularity and for a great thrill learn how to drive on ice (which may come in handy back home). During the cold weather, try the leisure facilities at any of France’s famous spa towns. Towns like Vichy in the Auvergne are world-famous, but there are hot thermal waters with public access in towns like Pombieres-les-Bains in the Vosges in Lorraine, Bourbon-l’Archambault in the remote and beautiful Auvergne, Aix-les-Bains in Savoie, and Evian-les-Bains on the shores of Lake Geneva, known the world over for the water it produces. If a town’s name ends in "les-bains", you can bet there are thermal waters and a spa there. Indulge yourself during the winter months when spa hotels offer great packages. Check out top hotels like the Chateau Audrieu in Normandy and most of the Relais et Chateaux group of hotels which are top of the range, and have great deals in the off-season. Start the winter round of festivals with the annual celebration of the arrival of Nouveau Beaujolais at midnight on the third Thursday of November. During the winter, music, and jazz festivals move indoors but keep on performing, while events like the Cheval Passion horse show bring fabulous equestrian acts to Avignon in January. Watch out for local festivals honoring St. Vincent in wine-growing areas, particularly Champagne and Burgundy, traditionally on January 22nd. The south of France defies the winter with events like the Limoux Carnival which begins in mid January, while the Lemon Festival in Menton heralds the end of winter and the start of Spring. While winter can be cold, you’re more than likely to get delightful warm sunny days though chilly nights along the Riviera and the Côte d’Azur. The temperatures are balmy during the day, so go for a brisk walk beside the sea, then sit in front of a roaring fire for an aperitif in the evening. You can get the best of both worlds in Nice, and swim (if you’re moderately hardy) in the morning in the Mediterranean, before driving the 90 kilometers up to Isola 2000 in the Mercantour National Park for a day’s skiing. Paris takes on a different dimension in winter. There’s nothing more magical than walking in the crisp air along the River Seine looking at the grand buildings in the clear winter light. When the summer tourists are gone, you feel the city is your own. Must-dos include dropping into Galeries Lafayette to see their giant Christmas tree with its fabulous gold ornaments. The holiday lights that line the Champs-Elysées are some of the most beautiful in the world. The Christmas markets sell everything that is seasonal, chic, and covetable. Disneyland Paris of course puts on a marvelous show and there are plenty of ice-skating rinks around to help you work off all those extra holiday calories. Buy a packet of roasted chestnuts to keep you going, or just sit on a heated terrace in one of the great sidewalk cafes, order hot chocolate, and watch the world go by. The sales season in France is government-controlled and in most French regions the winter sales start in mid-January and run to mid-February. Sales in France are proper sales, with shops selling off out-of-season stock rather than sub-standard stock bought in. As all good French women reckon that if you're out of season you might as well drop out entirely, it means great bargains for foreign visitors who don't care about the season but want good clothes at good prices. If you miss the sales, don't worry. There are bargains to be had in France throughout the year, particularly in the discount malls and shopping centers around the country which offer great prices on many top brands. You'll also find luxury shopping in Paris, but you won't find many bargains. Finally, don't forget St. Valentine's Day on February 14th. France has a Saint Valentin village but it's pretty crowded around the festival. The French claim St Valentine as their own, though the Brits have a thing or two to say about that. If you're in France in February, choose one of France's romantic cities.